BBC- 8 May 2013 Sir Alex Ferguson will step down as Manchester United manager at the end of the season after 26 years in charge. "Everton have yet to receive a formal approach from Manchester United for David Moyes - but all signs now point to the Scot being swiftly appointed as Sir Alex Ferguson's successor. "The choice will raise eyebrows in some quarters because the Scot has no serious European pedigree or trophies during his 11 years at Goodison Park but it is clear his stability, ability to build teams and willingness to give youth its chance appeals to the Old Trafford hierarchy. "And his long-standing friendship with Ferguson will help ease potential tensions between the new manager's office and the boardroom. There is mutual trust and admiration between the pair." Premier League: 1993, 1994, 1996, 1997, 1999, 2000, 2001, 2003, 2007, 2008, 2009, 2011, 2013. 17: Games missed due to touchline bans. 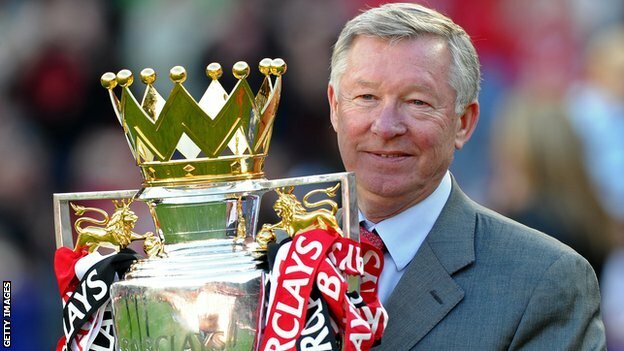 49: Trophies won as a manager with Manchester United, Aberdeen and St Mirren. 104: Players bought while at Manchester United. The last was Wilfried Zaha, signed from Crystal Palace for fee rising to £15m in January and loaned back to Palace. Ten slightly lesser-known facts about Sir Alex Ferguson, who has announced his resignation as Man Utd's manager after 26 years. 1. Once ran a pub. Ferguson has worked outside football, starting out as an apprentice toolmaker and shop steward in Glasgow and much later running a pub that he renamed Fergie's with a downstairs bar named the Elbow Room in memory of his physical style as a player. 2. Intrigued by JFK. Gordon Brown sent him numerous CDs about the assassination of JFK. Ferguson bonded with Brown over a shared interest in US politics. "Gordon sent me 35 CDs on it, which was brilliant of him," he told Manchester radio station Key 103 in 2007. Ferguson is fascinated with JFK. He said he kept JFK's autopsy report by his bed. He also has a copy of the Warren Report signed by [the former US president] Gerald Ford. 3. Gave the young Kenny Dalglish lifts. When Ferguson was at Rangers he gave lifts to a young Kenny Dalglish who was hoping to be signed. "Fergie used to give us a lift into town. He had such a big car," Dalglish told the Guardian. When Dalglish was picked up by city rivals Celtic he was forced to play centre back and mark Ferguson in a reserve team game. 4. 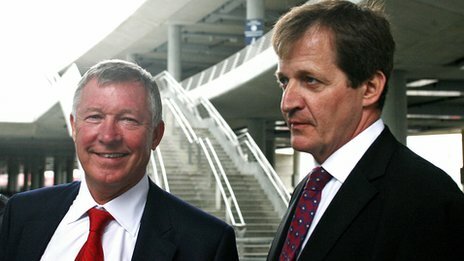 Told Alastair Campbell to get a masseur for Tony Blair. Ferguson was a big Labour donor and advised Tony Blair on leadership. The idea of getting a masseur for the election "battle bus" may have been a step too far, he later admitted. Better advice was when he said: "So long as you can keep all your key people in the same room at the same time, you'll be fine." 5. Not the longest serving manager. Ferguson was manager of Manchester United for 26-and-a-half years. The longest serving league manager in Europe was Guy Roux, who occupied the hotseat at French team Auxerre for 44 years, finally stepping down in 2005. Ferguson isn't even the longest serving Scottish manager. Willie Maley was Celtic manager from 1897-1940, clocking up 43 years. 6. Used to jump over walls as a boy. He grew up in a poor area of Glasgow where there wasn't much to do apart from play football, fight and jump over walls, known as dykes. "The dangerous ones had names - the king, the queen, the suicide, the diamond, the spiky," Ferguson once said. "You'd go to different areas of Govan to challenge each other into jumping dykes because it was very dangerous. But you do that when you're a kid because you've got no fear." 7. "Fergie time" is 79 seconds. "Fergie time" is the widely held belief by supporters of other team, that if Man Utd are losing after 90 minutes, the referee will extend injury time long enough for them to equalise or win. Last year, the BBC analysed Fergie time. It found that Man Utd were not unique in being given extra injury time when they were losing, although it appeared they got more than other teams. Games went on 79 seconds longer when Manchester United were losing than winning. Man Utd's towering achievement - securing the treble with victory in the 1999 European Champions League - was achieved in Fergie time, when they reversed a Bayern Munich lead, by scoring two goals after the 90th minute. 8. Alex or Alec? Many people in football refer to him as Sir Alec, assuming that his Scottish background will mean his name is pronounced in that way. But Scotland is strangely split on the Alex/Alec question, with people slipping between the two, often without noticing. BBC Sportsound presenter Richard Gordon said he had found himself using both forms. 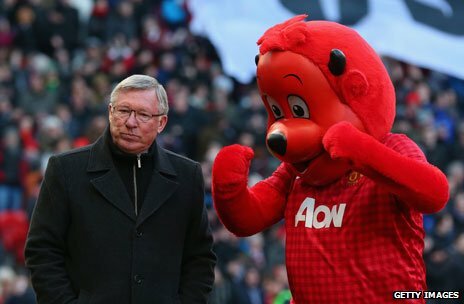 He said that former Ferguson colleague Willie Miller often calls him Alec when talking on the radio and ex-Scotland manager Craig Brown is prone to using the informal Alec, quickly followed by the more respectable Sir Alex. Carole Hough, professor of onomastics, says she can think of no particular reason why people would choose one or the other, except that Alec is slightly shorter. She said both names were popular in Scotland and England, with Alec perhaps having more currency north of the border. 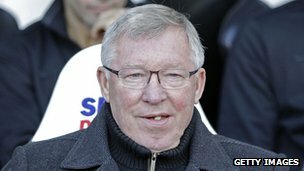 Ferguson's habit of furious, grim-faced gum chewing, prompted the spoof news website Newsbiscuit to claim that "his gum chewing habits could power an area the size of Lincolnshire". 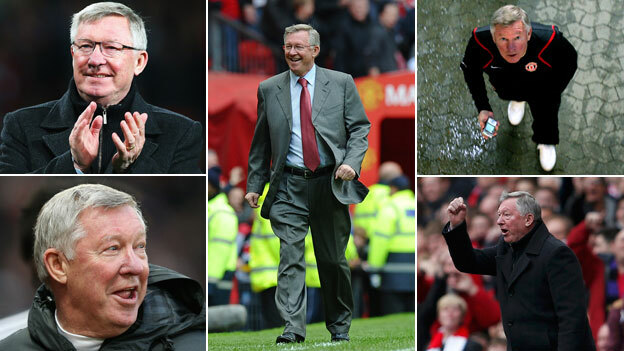 It's been estimated that Ferguson gets through about 10 sticks a match, which means that - over the course of his tenure at Man Utd - he's chewed enough sticks to stretch twice around the Old Trafford pitch. 9. The "hairdryer treatment" and "squeaky bum time". Ferguson was responsible for two memorable coinages. 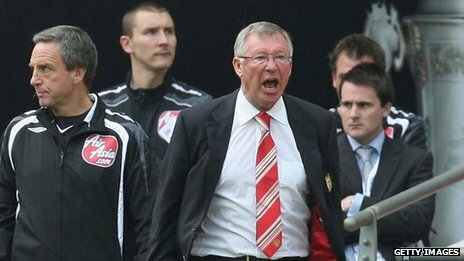 Players speak in awestruck tones of what it is like to be on the receiving end of Sir Alex's temper. The "hairdryer" - for its sound and heat - became the chosen phrase. Players talk of the moment a switch is flicked in Fergie's head, he presses his face close to the you and emits a terrifying torrent of abuse. Former United winger Lee Sharpe - famed for his extracurricular activities - has been credited with inventing the term. David Beckham said: "The fear of getting the hairdryer was the reason why we all played so well. He was a manager you wanted to do well for." 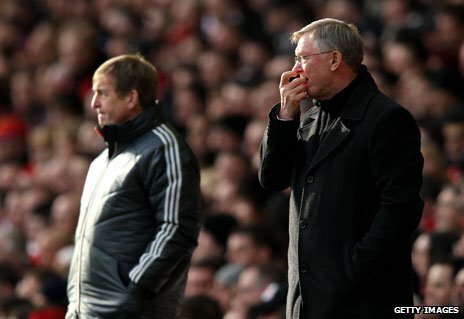 Ferguson also put his finger on the agony of watching a tense sporting moment. It is thought he first used "squeaky bum time" in March 2003 as his Manchester United team clawed back the lead from rivals Arsenal in a tense finale. It has become part of the football argot, especially at the climax of a season. It first entered the Collins English dictionary in 2005 with the definition "the tense final stages of a league competition, especially from the point of view of the leaders". Wikipedia notes the act of "squirming or moving forward and back in one's seat while watching an exciting sporting event".